You may be the most diligent consumer, yet still be taking home bags and bags of toxic chemicals from the grocery store each and every visit. Sure you read labels, but do you really know what all those chemical names mean? Are they responsible for your allergies? It is simply no longer enough to eat the types of food that promote healthy living because in today's chemically-saturated world we have to dig deeper than ever and educate ourselves as to the purity of our food. And Of course, it's not only food that we have to be concerned about; our bodies react not only to what we put in them, but what we put on them as well. Although it's possible to live a non-toxic lifestyle, we have to be proactive in the choices we make and the only way to do that is to educate ourselves. 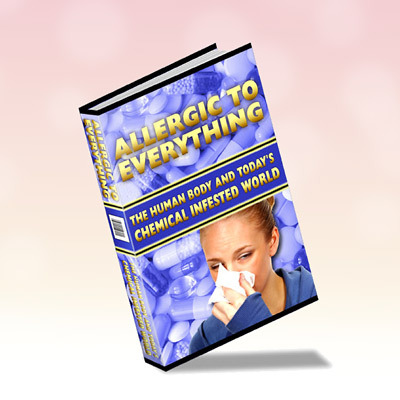 'Allergic To Everything' will teach you how to protect yourself from toxic chemicals and poisonous practices before you ingest any of the products on the latest recall lists. This eBook is power packed with everything you need to know to make informed decisions as to the products you choose, the food you consume, and the healthcare options that you have.